In her current show, She Bop at City Limits Gallery, the local artist mixes kitsch, quilting, and fine art. 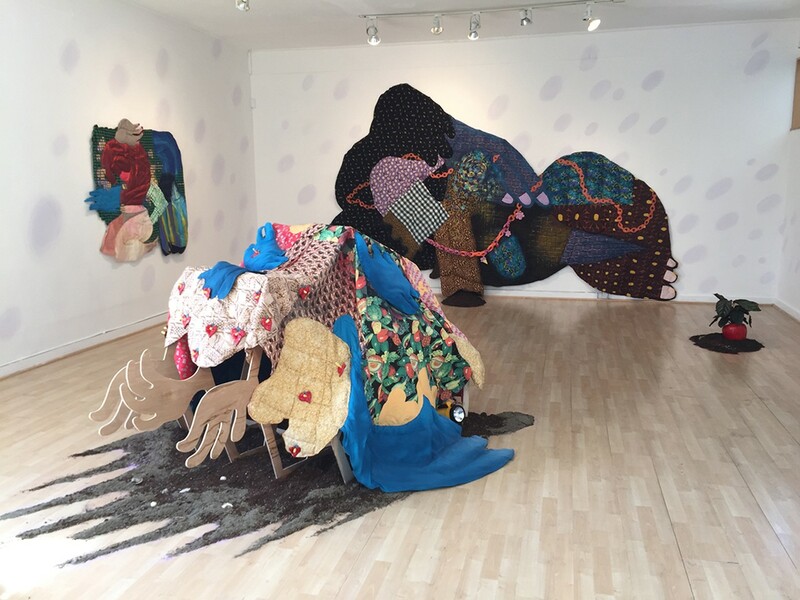 Maria Guzmán Capron's work is made mostly from discounted fabrics. In Cyndi Lauper's 1984 music video for her controversially risqué song "She Bop," the Eighties pop idol dances circles around a line of "Burger Klone" customers marching out of the restaurant in matching, white outfits. Lauper, on the other hand, is wearing a green bustier; huge, studded belts; and a floral wrap over gold lamé leggings — all of which clash with her garishly orange hair. The video is rich with indulgent camp. Meanwhile, Lauper repeats her bubbly euphemism for unabashed self-pleasure — She bop, he bop, we bop. "She Bop" is also the title of Maria Guzmán Capron's current solo show at City Limits Gallery (300 Jefferson St., Oakland). Capron mostly makes large, quilted sculptures pieced together from loud fabrics found at discount stores. They vaguely mimic figures and body parts, but only of the oddly amorphous sort. 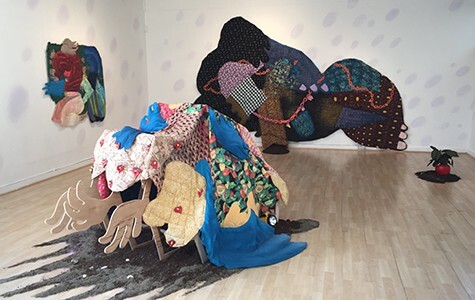 In She Bop, huge hands folding into each other form a large, puddle-like shape on the wall, patterned with blue, tropical leaves, cheetah print, pastel sea shells, and plaid. The hanging piece is also adorned with handmade ceramic charms — a flower, an ice cream cone, a heart. The centerpiece of the show is a fort-like installation made from a quilt that's draped over a wooden structure slightly resembling the skeleton of a house with three languid hands emerging from its façade. The front is dotted with shiny, ceramic, red anthuriums that highlight the apples in the fruit-covered fabric at the back. To tie the show together, soft, purple spots cover the gallery's open wall space like reflections from a disco ball. The fabrics that Capron uses deliberately clash, and her ceramics have a cheesy charm. More bluntly, the work is tacky. But it embodies tackiness in a tricky way. "I think sometimes they really don't work, but that's what works," said Capron of the way she pairs her fabrics. "Sometimes, I'm like, 'Oh, this is so ugly. I love it.'" Capron's aesthetic embraces kitsch so sincerely that conventional measures of taste fall into irrelevance, which premises the show on a recalibration of cool altogether. If She Bop was an adolescent, it would relish being outside of the in-crowd. Capron, who is based in Oakland, was born in Milan, Italy to a Peruvian mother and Colombian father. When she was fourteen, she moved to Colombia for a few years, then to Houston at the age of seventeen. After overcoming her culture shock, she found she felt most at home in Houston's sprawling thrift stores. She began to collect cute decorations, kitschy items, and unstylish clothing. She was drawn to the honey-sweet appeal of their aesthetics, and liked the fact that it represented something untrendy — out of line with the prescribed fashion taste at the time. That disregard felt creatively freeing. Capron is clear that her intention is not to reclaim crafting mediums that are considered domestic. While she's not at all opposed to that reclamation, she's not interested in fighting for the inclusion of kitsch into the elite club of fine art. Rather, her work is about pleasure — specifically, eliciting pleasure from aesthetics so indulgently focused on pleasing the eye that they are often discarded as cheap tricks. She likes that quilted fabrics remind her of the suppleness of the human body, and that she can manipulate them to also evoke muscularity — exploring the ambiguous relationship between gender and bodily forms. But, in regards to those conceptual ventures, Capron, again, holds no agenda. In that way, She Bop functions like one of the tchotchkes she used to collect: Not meant as a means beyond being enjoyable to look at. And it is enjoyable.